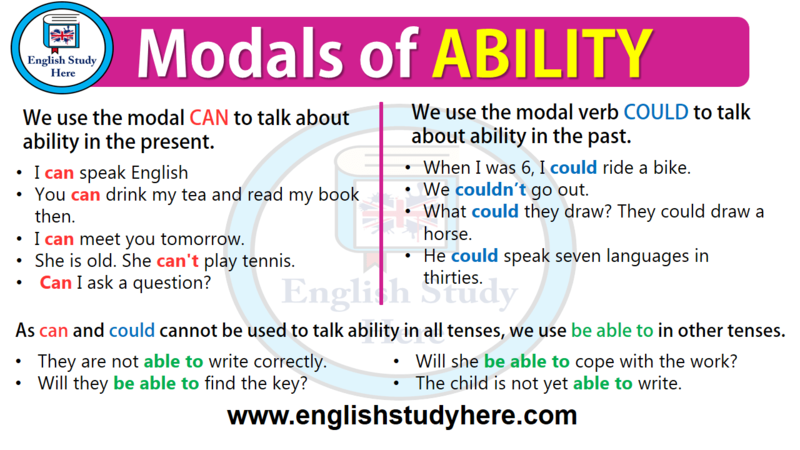 We use the modal CAN to talk about ability in the present. You can drink my tea and read my book then. I can meet you tomorrow. She is old. She can’t play tennis. We use the modal verb COULD to talk about ability in the past. When I was 6, I could ride a bike. What could they draw? They could draw a horse. He could speak seven languages in thirties. As can and could cannot be used to talk ability in all tenses, we use BE ABLE TO in other tenses. They are not able to write correctly. Will they be able to find the key? Will she be able to cope with the work? The child is not yet able to write.